Easter eggs have been confirmed for Wolfenstein: The New Order. Watch footage of them all below. Location: In Chapters 5, 7 and 9 you’ll have access to the central Berlin hideout house that you and the Resistance have made your own. How To Unlock & Play: Go into a room on the top floor with some crates and an empty bed with a light and Wolfenstein 3D poster above it. Walk up to the bed’s pillow/mattress and you’ll get the “Nightmare” indicator on-screen. Hold the action button to activate a bonus game… the first level of classic Wolfenstein 3D! You get to play “Escape from Castle Wolfenstein” with its glorious ‘2D graphics’ until you die and then you’ll wake up again in the bedroom you were in. A) Replaying or restarting the Chapter you’re in and going back to the Wolfenstein 3D poster room. Finishing Wolfenstein 3D Level 1 will only result in you waking up in your bed. B) It becomes available again after each time you return to the hideout (after missions). Take a look at Wolfenstein 3D running in the new Wolfenstein: The New Order engine! Collect Enigma code pieces to complete Enigma code puzzles within the Extras section in the Main Menu. A solved Enigma code puzzle with unlock bonus modes. You’ll first need to collect each of the individual Enigma Code Pieces in the campaign using our locations guide (listed at the top of this page). Location: In Chapter 4: Eisenwald Prison. During your escape, there’s a reference to the original BioShock game! Vault 101 from Fallout 3 makes an appearance in Wolfenstein: The New Order on “Chapter 5: A New Hope”! It’s not a coincidence, since both game series are published by Bethesda Softworks. If you look at Bobby Bran’s Keys before he drives into the building, he has a Quake 3 Rocket Launcher on his Keys! Can only be found in Wyatt’s timeline. In the Resistance safehouse in Berlin after you escape from the cement labor camp (you get to visit there in Chapters 5, 7 & 9) with the scientist you get to jam with none other than music legend Jimmy Hendricks who is J in the safe house. Just go to his room like you would and try to fix your self an armor upgrade, then he feeds you acid and the jam begins. Discoveries made by Maka, Brian, Retrokid, FusionZgamer, Pete & Guest. 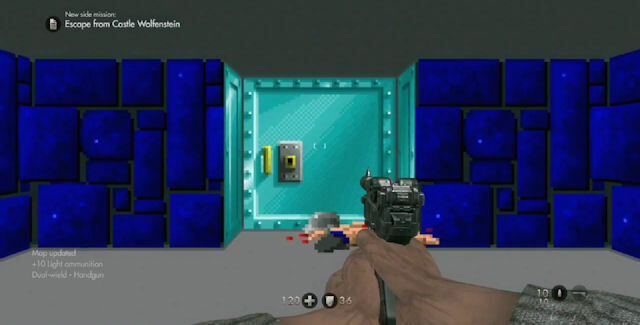 Have you found any Wolfenstein: The New Order easter eggs?